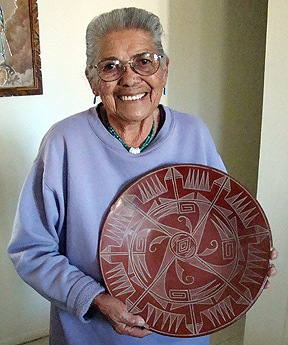 Holding a polychrome plate by her grandmother, Susana. 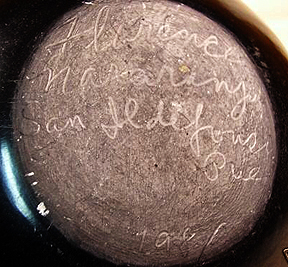 According to the book "Pueblo Indian Pottery" by Gregory Schaaf, Florence was active from 1940. However, the picture on page 210 shows her with her Mother holding a pot and the picture is dated c. 1935. This would make her about 14 years old in the picture. My suspicion is the picture is older then this. 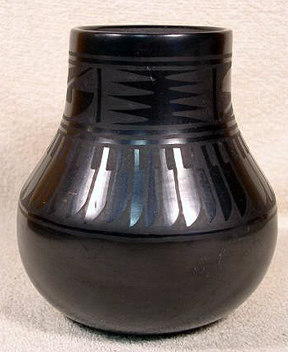 Her work includes black-on-black jars, bowls and rugs. 6 ½ inches high, 5 ½ inches wide at widest point. 3 ¼ inch diameter mouth, 3 inch diameter base. Sometimes the artist even makes a blunder. Here Florence accidentally repeated the "ar" in her last name.